Tour the Undesign the Redline exhibit, then discuss The Color Law by Richard Rothstein with the Eclectic Evenings Book Discussion group. In this groundbreaking history of the modern American metropolis, Richard Rothstein, a leading authority on housing policy, explodes the myth that America’s cities came to be racially divided through de facto segregation—through individual prejudices, income differences, or the actions of private institutions. 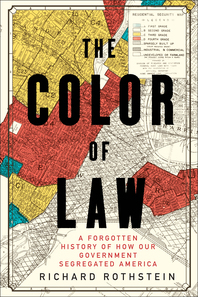 The Color of Law makes clear that it was de jure segregation—the laws and policy decisions passed by local, state, and federal governments—that actually promoted the discriminatory patterns that continue to this day.